Visit Blackpool and Las Vegas to Put the P in "Pristine"
Rue Cler: The Ultimate or Not? 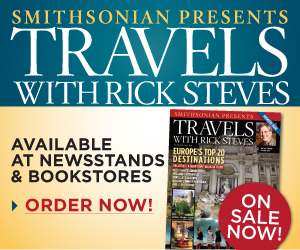 Experience Rick Steves' Europe on our Best of Europe tours where you'll get more travel thrills per mile, minute and dollar. Sign up for regular email updates from Smithsonian magazine, including free newsletters, special offers and current news updates. Smithsonian.com expands on Smithsonian magazine's in-depth coverage of history, science, nature, the arts, travel, world culture and technology. Join us regularly as we take a dynamic and interactive approach to exploring modern and historic perspectives on the arts, sciences, nature, world culture and travel, including videos, blogs and a reader forum.